Furious 7 was once a box office monster, but defeated by Avengers: Age of Ultron that delivered bigger crowds. It's not over, Jurassic World now tops Avengers 2, what's the next winner? 2015 is a year when we never lack blockbusters to watch every month! What are the must-watch movies in 2015? Without further ado, I count down top movies list from Hollywood, Bollywood, Disney, etc. For those who have collected these movies on DVD, MacX DVD Ripper Pro may help you a lot in DVD backup and digital copy. You can rip copy protected DVD to MP4, AVI, MOV, WMV, and other digital video format, or ISO image for later burning to DVD, regardless of DVD protection technology applied by Disney, Warner Bros, Paramount, etc. So you can watch the best Hollywood Bollywood Disney movies on your smartphones, tablets, gaming systems, tvs or other mobile devices anytime and anywhere. You can also apply this fantastic movie downloader to get 2016 best movies download for offline watching. Why to watch: twenty-two years after Jurassic Park release, Jurassic World was back with improved computer generated imagery, which means the must watch movie from 2015 summer would give us much more amazing dinosaur action. It is difficult or even impossible for Jurassic World to win over the Steven Spielberg's original one, but why refuse the representation of the classic? I bet Jurassic World will sit on the No.1 spot. Why to watch: "It's never-goodbye. You'll always be with me, and you'll always be my brother." It continues the insane and wholly action but takes a step beyond that, saying farewell to Paul Walker. It won't be the last Furious installment, but it is the last one in which we can see Paul Walker for sure. On the other hand, the complex winding structures, Director James Wan's skills used in the horror world also make the movie awesome. Titled as one of the most popular movies 2015, Furious 7 is likely to win Academy Awards and turns into the best Oscar movie. It deserves a spot on your must-watch movies 2015 list. Why to watch: the Cinderella film 2015 is not the most classic one, but there are reasons it crowns the best Disney films of 2015 to watch so far, Lily's nuanced performance, the gorgeous costume design, beautiful design, every single detail is perfect. And we never get tired of fairy tales. It is a must watch Disney movie for your kids and family movie night. 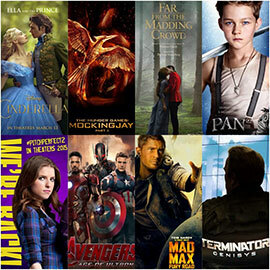 For more hollywood movies, check out the list of best hollywood movies list. Why to watch: the first half year brings us tons of top movies in 2015 to see, Avengers 2, Inside Out, Furious 7, Terminator Genisys, etc. I'm afraid Star Wards 7 will have no pressure to win the title of upcoming must watch movie from 2015 second half year. The Star Wards VII will be set 30 years after the battle of Endor. The movie wont hit the theater until December, 18, 2015, but you can download the Star Wars 7 official trailer teaser now to get an early taste of this 2015 must see Disney movie. Why to watch: Bajrangi Bhaijaan is new upcoming Hindi movie 2015 and top Bollywood film 2015 you must watch . Despite it won't arrive in theater until this July, it seems that Salman Khan's Bajrangi Bhaijaan has already become the best new 2015 Bollywood movie. It is the best Hindi movie to watch in 2015, thanks to Salman Khan jokes, mouths twisted versions of iconic words. Why to watch: ABCD 2(Any Body Can Dance) tells an Indian dance troupe's ups and downs during the journey to their rise to fame. Dance performance is quite impressive. And I guess you will be surprised by the 3D technology used in the dance sequences. DVD version is one of top DVD rentals from Netflix etc.